1. The Idea: Taiwan shares. 2. The Consensus View: Currently, “Slumping exports” are causing foreign investors to sell Taiwan shares. Previously, a lack of certainty over Taiwan’s political status also dampened investment. Because of this, Taiwan is almost completely off the radar of the investment world. 3. The Variant Perception: As we showed at the top of the U.S. market in October 2007, foreign investors usually do the wrong thing at the wrong time. (“Investors from Europe, Asia, and the Middle East are buying U.S. stocks in record amounts.”) Taiwan shares have languished in a sideways trading range for 22 years. During this same period, their largest manufacturing companies have become the world leaders (#1 or #2) in their industry. Because of their massive personal and governmental savings, Taiwan can be less dependent on “slumping exports” if they decide to actually spend some of their own money. Further integration with China can also bring more political certainty and increased economic activity. The current selling provides long term investors with an attractive entry point into this market. 4. The Trigger: The election of President Ma, which brought about the Economic Cooperation Framework Agreement (ECFA) with China in 2010. As we explained in September, this marked the first steps of Taiwan’s further integration, not only with China, but with the global economy. "In 1987, Taiwan’s Nationalist government lifted martial law and eased restrictions on contact with the mainland. Many of the exiles who helped Taiwan prosper and grow had been forced to leave families and friends behind when they fled the mainland. As these restrictions were lifted, a massive increase in flows of capital, products and eventually people between Taiwan and China resulted." After the “ease of restrictions” in 1987, the Taiwan stock index rose from 1,000 to 12,000 over the next three years. We expect further integration to also be positive. Recent media headlines report that Warren Buffett is “reloading his elephant gun” and “salivating” for a “big acquisition.” While this may encourage the investment herd (“Well if Warren is going to buy and I’ve already bought, then I feel smart…”), the reality is that Warren’s loaded gun is pointing at them. When Warren says he is “reloading his elephant gun,” it really means he is increasing his cash hoard. Over the last year, Warren’s buying potential (cash) has grown from $38 to $40 billion. Warren has not only been building up cash from his income, he has even been an outright seller of current stock holdings in the second and third quarter of 2012 (even more cash!). As we stated this summer, “when the public believes that a sure thing arrives, insiders begin taking profits.” So what is he waiting for? Why only twenty opportunities? We do not think it is a coincidence that investors experience roughly twenty panics in their lifetimes. The best time to buy is when the investment herd panics. It’s the best way to assure you are getting a decent price. All the hope and optimism is squeezed out of the price. In a recent CNBC interview, Warren describes these conditions: “And they're more likely to come along when either money conditions are fairly tight or something of the sort…” But currently, “People that do leverage are getting significant portions of the purchase price at very, very low rates, probably as low as they've ever gotten. So that enables them to bid pretty aggressively.” He goes on to add that “acquisition prices are getting out of control” because “money is cheap.” Get ready. Buying frenzies turn quickly into money panics. We suspect Warren will continue with his purchase of IBM when he gets better pricing. “Investors should purchase stocks like they purchase groceries – not like they purchase perfume.” – Ben Graham. Rising costs are also not good for corporate earnings. Currently, “The entire S&P is not growing its profits at all, year over year or sequentially. That’s basically an earnings recession without an economic one.” We will see if future revisions to the economic data align the two. “With this global slump at hand, a highly relevant question is whether the U.S. can escape a severe recession in light of the following: a) the U.S. manufacturing sector that paced domestic economic growth over the past three years has lapsed into recession; b) real income and the personal savings rate have been slumping in the face of an interim upturn in inflation, and c) aggregate over-indebitness, which is the dominant negative force in the economy, has continued to move upward in concert with flagging economic activity.” – Van R. Hoisington and Lacy H. Hunt, Ph.D. Van Hoisington Investment Management. 3rd Quarter 2012. 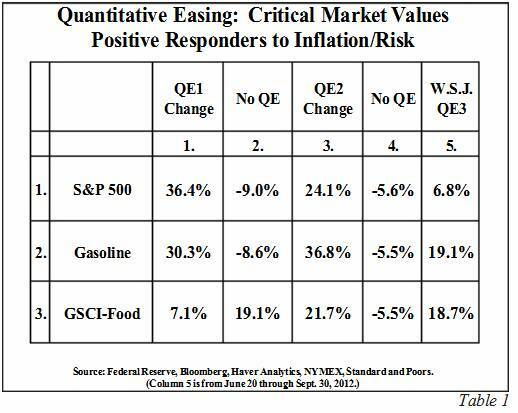 While the Fed’s power to levitate stocks is being called into question (as we suspected), the rise in everyday living costs might cause an investor to fret over inflation. The Fed has indeed printed up $2.3 Trillion in bank reserves since 2009. 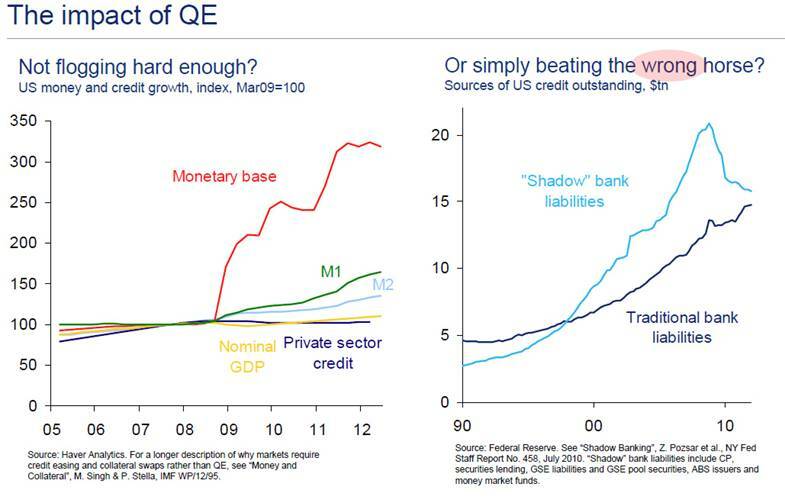 But the “shadow” banking system has declined $6 Trillion (see chart below). Right before the recent 1000 point decline in equities, the NYSE margin total was back up to $315B. We noted this same high level of leverage in the stock market back in May of 2011. The market was subsequently down for the next 22 weeks. In August, speculator funds were seen “doubling down” on commodities in anticipation of QE3 in September. No wonder the grocery and gas bill went up! Now these same funds are cutting bets on commodities in longest retreat since the recession of 2008. In bonds, even more outrageous speculation is occurring. Regular investors have fled stocks and rushed into bonds. So much money has flooded into bond funds ($400B, more than in 2007! ), that bond fund managers are buying up riskier bonds, “even though they might want to hold their nose.” As the NY Times describes: “so much of the money going into these bonds is coming from individual investors who may be unaware of the declining credit quality.” The Wall Street Journal is blatantly asking “Do Junk Bond Investors Have Junk For Brains?” With junk bonds and stocks trading almost in sync (chart below from UBS), fleeing stock investors have created the very situation they fear. In fact, it may be worse. Bond pricing is VERY opaque and illiquid, when the panic starts there is simply no exit. Expect a SkyFall for the bond market with most bond holders underwater for the remainder of their durations. It was as if the Rolling Stones provided the soundtrack for Wall Street’s May 2010 Flash Crash. Now with both stocks and bonds “The Terrible Twin Investments,” the Glimmer Twins, Jagger and Richards, are back. Investors should expect a “Crossfire Hurricane” as after “a five year hiatus“ the Rolling Stones “take to the stage later on Sunday.“ Reuters reports: “The concerts are the culmination of a busy few months of events, rehearsals and recordings to mark 50 years… There has been a photo album, two new songs, a music video, a documentary film, a blitz of media appearances and a handful of warm-up gigs in Paris.” This should be the last time for investors to sell bonds and stocks at these rich valuations. "Once the juggernaut starts rolling, it ain't gonna stop," Richards told Rolling Stone. The Rolling Stones’ two new songs are “One More Shot And Doom and Gloom.” As they describe themselves, they are the “Anti-Hero“ that wears “the black hat.” These “actors playing the part” have shown their prowess in timing the mood for fifty years. Who are we to disagree? For investors, the only way to get out of the way is to hold very short term U.S. Treasury Bills (cash) at a secure financial institution. After poring over 21 bank and brokerage balance sheets in October, we look forward to sharing our conclusions on financial institutions. “We're in a hole. We're just gonna have to dig ourselves out.” – Dumb & Dumber.